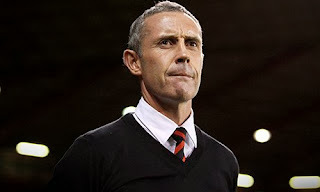 When David Weir was appointed back in June, no one expected his first run in football management to be over after 13 games, with one victory and Sheffield United in the League One relegation zone. A season of consolidation with some player churn was expected, that might not mean a top 6 position of the like United had achieved for the last two years, but not the abject failure that has followed. At the time of his appointment I did ponder whether there was an element of the fans (me included) being relatively happy because, when compared with other candidates and names that had appeared in the press, he appeared a breath of fresh air. I also suggested that he lacked the experience of management (and League One) that, in our current situation, might have been preferable. However, his coaching qualifications and a wealth of playing experience in both top level club football and at international level partly. He spoke calmly, confidently and well about what he wanted to achieve and how he was going about it. Whilst there is no doubt the subsequent investment in the club changes the landscape, it has also hastened the decision making. Whilst his footballing philosophy could not be faulted, it wasn't working and in a results driven business there needs to be short term points gain otherwise confidence drops and results are harder to come by, however pretty the football is. And even the football wasn't that pretty; plenty of passing, but little incision and pretty ineffective in the final third. Minimal chances were created, decision making was defensively minded, yet still the team conceded game after game. Just two weeks ago I was still preaching for patience. The Preston North End game raised fans' hackles yet I still felt the potential for improvement was there if Weir demonstrated some flexibility, a willingness to adapt and time was allowed for the many new faces to bed in. I wanted David Weir to succeed, because that meant that United succeeded and teh club wouldn't be going through more turmoil and change. Even after the Crawley game, the first half of which was possibly one of the worst 45 minutes of football from a United side I have ever watched at Bramall Lane, I still had hope that Weir would put it right. The improvement in the second half wasn't difficult to achieve from such a low starting point, but the manager at least showed some variation in tactics and plan. It was still nowhere near where it needs to be, but there was an element of progressive thinking. Then came Hartlepool in the Johnstone Paint Trophy. A performance so devoid of spirit, passion and belief, both on and off the pitch that I struggled to see a way back from that point. Rumours of player discontent with tactics and coaching staff were clearly demonstrable. The players seemed dis-united, not that they were arguing with each other, they lacked the passion to even argue and fight their cause. Saying a manager has "lost the dressing room" is a bit of a cliché, but if the players claim they were playing for the manager on Tuesday night, they are liars. They were barely playing for each other. In some ways I feel sorry for Weir. He has tried to effect change, possibly too quickly, and as a result has clearly suffered from dissent. The players are better than how they have been performing. Yes some of their on-pitch failure is tactical, but the problems run deeper than that. Rumours of cliques and trouble-makers pre-date Weir's arrival and as an observer you cannot help but feel that the stories have some credence. Not all the problems that have plagued United's start to the season are managerial. As the manager heads to the exit door, the players remain. They don't have to face up to their ineptitude or the consequences of a poor attitude. I feel that some will be quite happy right now, and I am not sure they are the kind of players I want at the club. One other worthy of further scrutiny is Head of Football Operations, John Stephenson. On arriving from Watford with a glowing reputation, he has had an active role in Weir's arrival, the changing structure of the club and academy, the over-arching playing philosophy and the identification and recruitment of players. Yet he sits silently in the background, without the pressure of observation or direct criticism. The timing, coming more than two days after the Hartlepool defeat and no more than an hour after Weir performed his pre-(Coventry)match duties with the media, points to a realisation that any success on Sunday was going to provide only short term succour and that the board couldn't wait until next week, when a sacking after a draw or victory would have seemed more callous. It also suggests they waited to have a shortlist of candidates lined up and you would assume the time has allowed them to sound out candidates for positive interest. Swift change, as promised by director Jim Phipps, is vital after the drawn out and publicly embarrassing shambles in the summer. Certain factors have worked against Weir. Arriving so close to an already planned pre-season meant he had little chance to prepare the players how he would have wanted and hastily arranged additional pre-season friendlies saw the manager shuffling the pack trying to establish the best combination right up to the start of the season. The loss of Kevin McDonald should not be under-estimated, especially given the importance of his role in Weir's chosen formation and planning. The investment has also heightened expectations and although he has had the ability to recruit, trying to integrate so many new players in a short space of time is not easy. Where he has failed, and what any new manager needs to address, is in taking a team with one of the best defensive records in the country and leaving them apparently susceptible to conceding every game. He also failed to deal with the lack of goals and a goal scorer which has affected United for several seasons, either side of Ched Evans' prolific final season before incarceration. Instead he has packed the team with midfielders to create chances for non-existent strikers. There is also the failure to man-manage a playing group with disruptive influences and a lack of on-field leadership. Whoever takes charge at Bramall Lane, needs to be a strong personality and willing to deal with long running issues on the playing side. There are clear tactical decisions to be made although there isn't an unlimited transfer kitty to deal with defensive frailties and attacking gaps, you can imagine there will be significant churn of players in January. This is a group of good League One players who should be up and around the Top 6, what it needs is a manager with lower league success who will take the club and team to where they should be. After watching the first game I was upbeat, we created chances, could and should have scored more, things looked promising, since then, a lack of passion, a lack of urgency, its like watching a pre season friendly. Needs a big character to bang a few heads together, not sure Clough can do that, listening to Phipps interview the passing style is not up for debate and will not be changed, rules out Pulis, the one big character who would get them motivated. Great blog again Ian. The last para is spot on. It's exactly what we need. Rules out a lot of the names that have been banded about so far...At the moment we need to get results to get us out of this mess, I will always admire the desire for pretty football however is it going to get us out of this...Short sharp shock tactics is what is needed right now. My opinion for what its worth, is get Pulis on a 2 year deal, get us promoted then reassess the situation. The more I think about it the more I think it will be Clough, no compo, used to operating on limited budgets, prefers the passing style, clean image and playing/managing CV will probably appeal to international investors ,comes with no significant baggage or debatable history. Lets be honest who ever it is there will be a certain amount of folk that would have preferred someone else! I think its worth noting that the change in tactics against crawley was enforced due to injury. I am not convinced it would have changed had Cuvelier not been forced off. I think Weir is still naive and would have persisted in his ways. wanted him to succeed: a nice guy with nice ideas, but nowadays its results that make the axe swing. Have to agree, the injury forced his hand, we have been pedestrian moving the ball for a couple of years, I blamed Macdonald, but since his departure, no change.